The SMA Sunny Tripower STP 5.0-3AV-40 Solar Inverter makes PV systems in private households especially powerful. It combines top inverter performance with maximum ease and comfort for its users. With integrated services and shade solutions, it can meet any challenge found on roofs. The SMA Sunny Tripower STP 5.0-3AV-40 Solar Inverter reliably ensures maximum solar yields and reduces electricity costs. 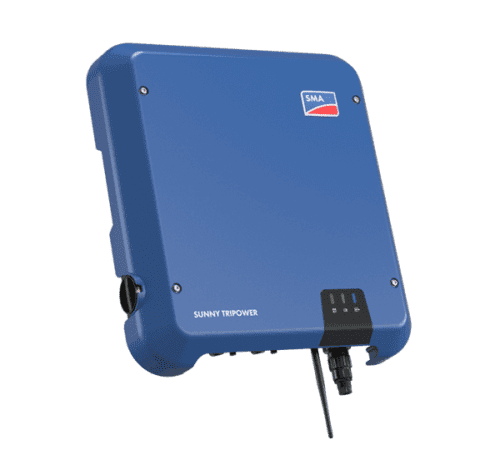 With SMA Smart Connected, SMA is the first manufacturer to offer free and automatic inverter monitoring that helps installers provide customers with a quick, targeted service. If an inverter fails, SMA Sunny Tripower STP 5.0-3AV-40 Solar Inverter proactively informs the PV system owner and the installer. In this way, PV system owners and installers benefit from minimized diagnosis and downtime. If it is necessary to replace the inverter, SMA sends a replacement device fast and free of charge. SMA from its headquarters in Kassel, Germany, is the world’s largest producer of solar inverters and monitoring systems for photovoltaic applications. As market leader for solar inverters SMA is setting benchmarks again and again. The leading-edge efficiencies of 98% and new technology ensures maximum yields and the highest user convenience. While SMA inverters are designed in Germany, the Sunny Central, the Sunny Island, and SMA SunnyBoy inverters in the 3 kW to 7 kW range are assembled in their new plant in Denver, Colorado.These inverters qualify for the ARRA recovery act and are UL and cUL listed. SMA launched its own SMA solar academy in Rocklin, California, in April 2011. Join our ZERO Home Bills Community. BEST Solar Inverters from the BEST Solar Energy Brands at BEST Prices for ZERO Home Bills on ZEROhomebills.com by Solaranna. SMA from its headquarters in Kassel, Germany, is the world’s largest producer of solar inverters and monitoring systems for photovoltaic applications. As market leader for solar inverters SMA is setting benchmarks again and again: leading-edge efficiencies of 98% and new technology ensures maximum yields and the highest user convenience. While SMA inverters are designed in Germany, the Sunny Central, the Sunny Island, and SMA SunnyBoy inverters in the 3 kW to 7 kW range are assembled in their new plant in Denver, Colorado. These inverters qualify for the ARRA recovery act and are UL and cUL listed. SMA launched its own SMA solar academy in Rocklin, California, in April 2011. Their Solar Academy is equipped with the latest high-tech teaching tools and demonstration inverters to complement its comprehensive range of courses on photovoltaics and SMA products. The company offers a wide range of solar photovoltaic inverters including the SunnyBoy range starting at 1.2kW for small domestic applications through the larger Sunny Mini Central range for small commercial to the 100kW Sunny Central products for industrial scale applications. The range includes newly developed lighter and more efficient “high frequency” transformed products (-HF) along with transformless products (-TL). All inverters support a range of optional display and monitoring accessories for visualization of the system operation and many models have Bluetooth built-in as standard enabling fast integration with these additional products. Join our ZERO Home Bills Community. BEST Products from the BEST Brands at BEST Prices for ZERO Home Bills on ZEROhomebills.com by Solaranna.